I don’t think there is anything wrong with buying pre-made baby food from the store. In fact, there are a lot of organic options nowadays for baby food. Like most other organic things, it’s usually more expensive. Luckily for my baby, my husband and I are slow produce eaters. Yes, we buy the finest organic produce, but we’re human, we’re going to grab for the bacon before we grab for some fruit in the morning. That being said, I really needed to find a way to get my babe to eat more leafy green AND use up all the produce we buy before it spoils. 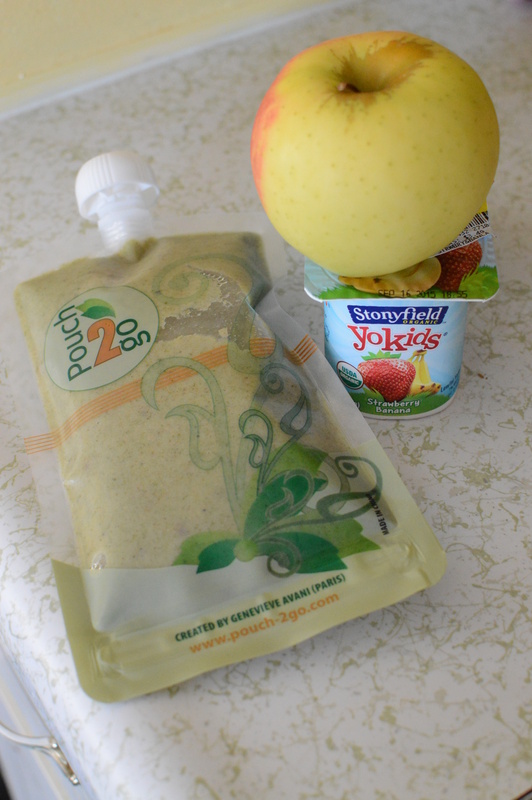 You can buy reusable pouches online, but some of them come with some kind of filling contraption in order to get the food into the tiny hole at the top of the pouch. If that works for you, great, but I for one rarely use appliances that have more than 2 pieces, so I knew if this was some thing I was going to commit to doing on a weekly basis, it was going to have to be easy. Hubs and I found these pouches that actually have a wide opening on the bottom of the pouch, so you can easily pour or scoop a puree into them. If you don’t want pouches that open at the bottom [I’ll admit I was skeptical at first] you can always use an icing/piping bag to fill your pouches with puree. In a skillet over medium heat, cook the apples and spinach until both are tender. Add to food processor with remaining ingredients, and pulse until everything is smooth. Pour into pouches and refrigerate. Did I mention the pouches we got can also be stored in the freezer? Like I said…. it’s a solution to using up produce before it goes bad!